Movies from the 1980’s seem a little more iconic than other decades. Tune to basic cable networks and you can see 80’s movies airing any time of the day. Some of these movies became cultural icons, and many of the classic vehicles driven by the characters were so instrumental, they became characters themselves. Put on your leg warmers and jean jackets, tease up your hair and play some Bon Jovi music. 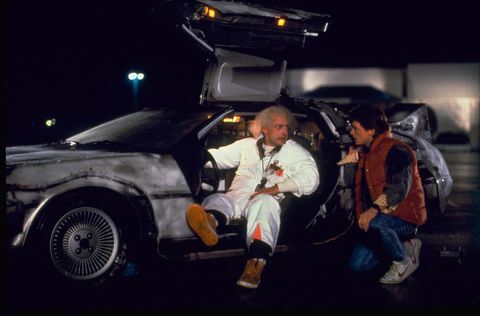 We’re taking a look back at the top 5 movie cars from the 1980’s. The so-called “Ecto-1” in the movie was heavily modified for the movie production of course, but even the original models sold in 1959 were 20 feet long and weighed nearly 3 tons. They were used both as ambulances and hearses. While filming the sequel “Ghostbusters II” the car broke down on the Brooklyn Bridge and caused such a massive traffic jam that the NYPD fined the production company. If you like old Cadillacs, we have a couple to choose from including this 1952 Series 62 convertible. 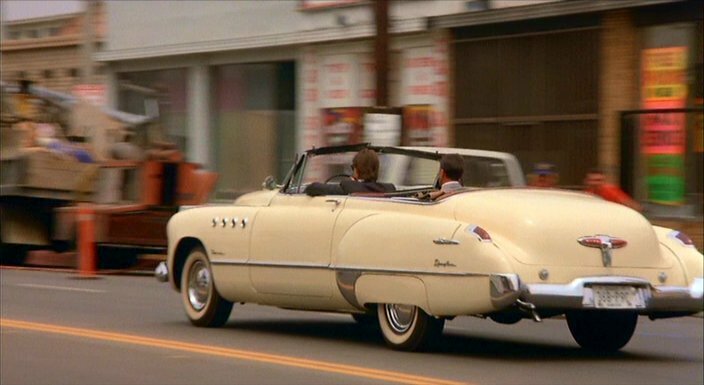 The ’48 Buick Roadmaster plays a large part in the movie and is seen through much of the film as Tom Cruise and Dustin Hoffman drive across the country. There were two Roadmasters used in filming, and a few years back one of them sold for more than $170,000! We currently have a classic 1942 Buick convertible for sale in our showroom. 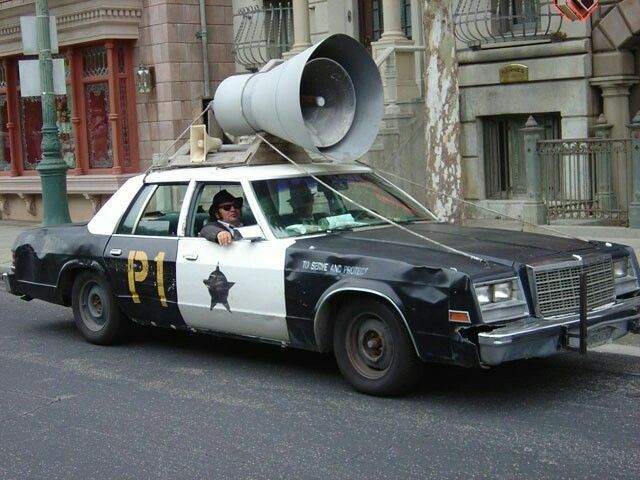 As Dan Aykroyd says in the movie, the Bluesmobile has a cop motor, cop tires, cop suspension and cop shocks. With the way they abused their car, it’s not surprising that 13 different Bluesmobiles were used in filming – all of which actually WERE former California Highway Patrol cars. With some of the most over-the-top car chase scenes every filmed, the movie set a record for most cars destroyed in one film. We love Mopar Muscle and have a few Dodges in our inventory, like this 1970 Dodge Challenger. 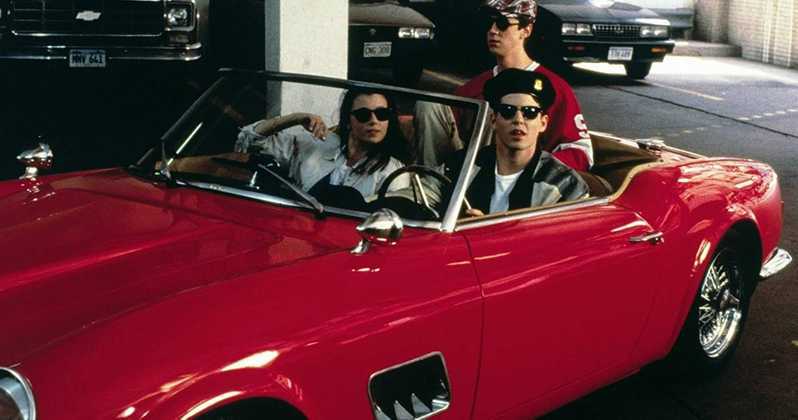 After deciding to skip school for the day, Ferris convinces his buddy to take his father’s prized Ferrari out for a day trip around Chicago. An actual, extremely rare ’61 Ferrari GT California was used to film close up/interior scenes. But three replicas were used for anything on the road, plus the final scene where it crashed through the window! If you’re looking for a more affordable Italian sports car, check out our 1976 Alpha Romeo Spider. Six different DeLoreans were used in the movie trilogy. The one used most frequently and is featured in each movie is now on display at the Petersen Automotive Museum in Los Angeles. But if you’re looking for a replica, a DeLorean club website has documented 87 different vehicles around the world that private owners have modified to look like the movie time machine. We don’t have a time machine in our showroom, but many of our classics are truly blasts from the past. There are a lots of honorable mention cars for this list, including the Family Truckster from National Lampoons Vacation, the Porsche 928 from Risky Business or any of the cars in the Cannonball Run movies. Whether you’re looking to buy a classic car or want to sell a classic car, Ellingson’s is the place for you. We even have our own Batmobile replica! You can always browse our complete classic car inventory here.